This year, seemingly more than ever, crazy colored flowers in all sorts of patterns and shapes not seen before are popping up at garden centers. Many of them are bicolors: flowers with two distinct colors in one. It can be tricky to design with them in container combinations, so here are a few tips to keep in mind when shopping this season. For the first time since we’ve been recording gardeners’ favorite colors, bicolors have surged to the top of the list. What exactly is a bicolor flower? By definition, it is a flower that has two distinct colors on its petals, say pink and yellow striped flowers for example. You’ll see four of the most popular bicolor flowers pictured below. Bicolors are different from bitones, which display two shades of one color, say light pink and dark pink on the same flower. Trying to pair other plants with patterned bicolor flowers is a bit like trying to pair a floral skirt with just the right top. You don’t want there to be too much pattern, but you want to find something that coordinates well. Whether we realize it or not, we use a design technique called “color echoing” when we dress ourselves. We choose a solid colored top in a shade that draws out one of the colors in our floral skirt, for example. 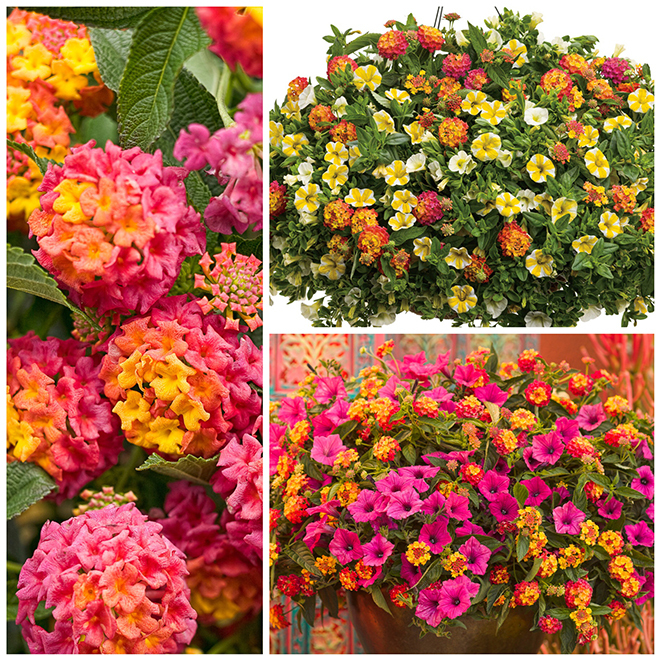 On the left is Luscious® Berry Blend™ Lantana, which bears fragrant clusters of tiny pink and yellow flowers. It actually might be considered a tricolor flower since we sometimes see orange flowers in the clusters as well. This is a sun and heat loving plant that can tolerate dry soil while flowering all season. The two combinations on the right each contain Luscious® Berry Blend™, but a completely different look is achieved in each. In the top combination called Glisten Up, we’ve paired it with yellow and soft white flowers to achieve a cooler overall tone. Since all three flowers in the combination are similar in size, the texture of this combination is very balanced and has a bit more formal look. In the bottom combination called Caribbean Day, the bicolor variety is paired with larger, hot pink Supertunia® Vista Fuchsia for a fun, tropical look that has a more casual flair. This will grow to be a very large, full container as the season progresses so start with a large container if you choose to go this route. 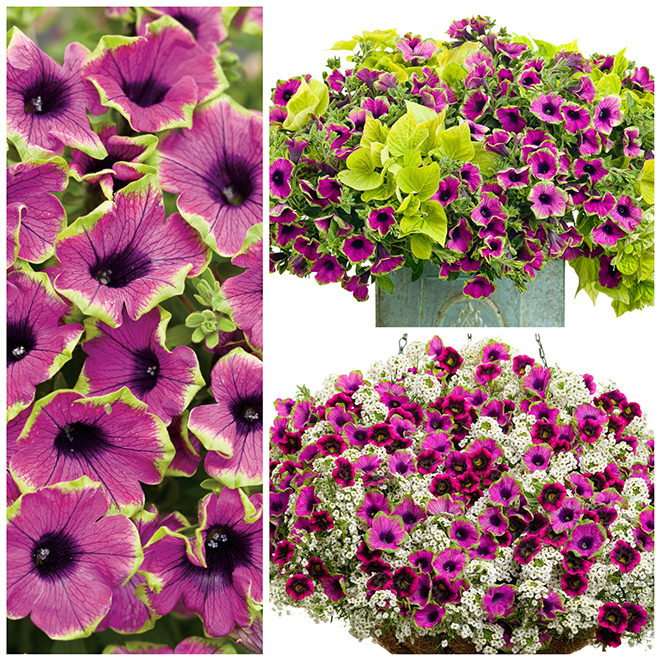 On the left is Supertunia® Pretty Much Picasso®, a unique bicolor petunia with magenta purple flowers rimmed in lime green. Its artistically patterned blooms really stand out from the crowd and the plant flowers like crazy all season long without deadheading. To pick up the flowers’ lime green edges, the top combination called Heartbreaker pairs Sweet Caroline Sweetheart Lime sweet potato vine with the bicolor blooms. This simple combination will grow vigorously and trail beautifully as the season progresses. The bottom combination called Picasso’s Nightmare is a bit more complex and achieves a completely different look. A second bicolor flower, Superbells® Blackberry Punch Calibrachoa, mimics the shape and style of the bicolor petunias, adding an extra strong pop of magenta and purple to the combination. The tiny, white flowers of Snow Princess® sweet alyssum knit the whole combination together while providing a blank background on which the other flowers’ unique qualities can really be noticed. 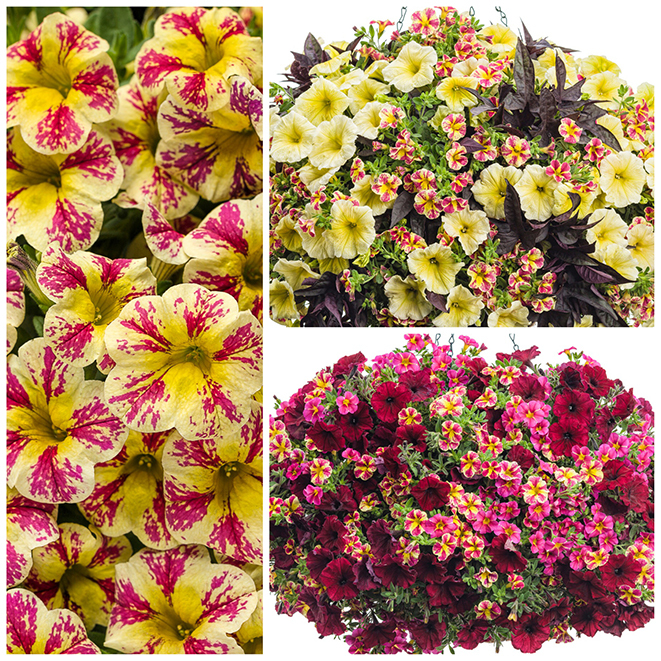 A new Calibrachoa called Superbells® Holy Moly!™ is becoming super popular because of its extraordinary bicolor yellow and fuchsia pink splashed blooms. No two flowers are exactly alike. It’s an amazing performer too, flowering prolifically in containers from spring to frost without deadheading. By choosing to draw out its yellow tones in the top combination called Talent Show, we’ve created a much cooler overall look. It is a bit less formal in appearance than the cool toned Glisten Up combination pictured above because of its broad mix of textures including large, round-flowered Supertunia® Limoncello petunias and the pointed leaves of Sweet Caroline Raven sweet potato vine. This will grow into a large, full hanging basket as the season progresses. A completely different look is created in the bottom combination called Let’s Get Together by pairing the bicolor variety with two other warm-toned flowers of similar shape. The larger, velvety red flowers of Supertunia® Black Cherry add a deep warmth and draw your eye in from a distance. Smaller flowered Superbells® Cherry Star has the same fuchsia and yellow colors as the bicolor flower, but in a more subtle pattern that does not clash with the more flamboyant pattern of Holy Moly!™. Think of the pairing of Holy Moly!™ and Cherry Star like wearing a striped skirt with a solid top accented by a colored collar, respectively. That’s color echoing at its finest. See how this technique works? Let’s look at one last example of color echoing using more neutral colored flowers. We’re starting here with Supertunia® Latte on the left, which somehow manages to have both a vintage look and modern appeal all at once depending on your viewpoint. Its creamy petals surround a coffee-purple throat which radiates out into the veins. Who couldn’t use a jolt of Latte every morning? In the top combination called Vanilla Truffle, we’re keeping things neutral by not adding in any other color to the mix. 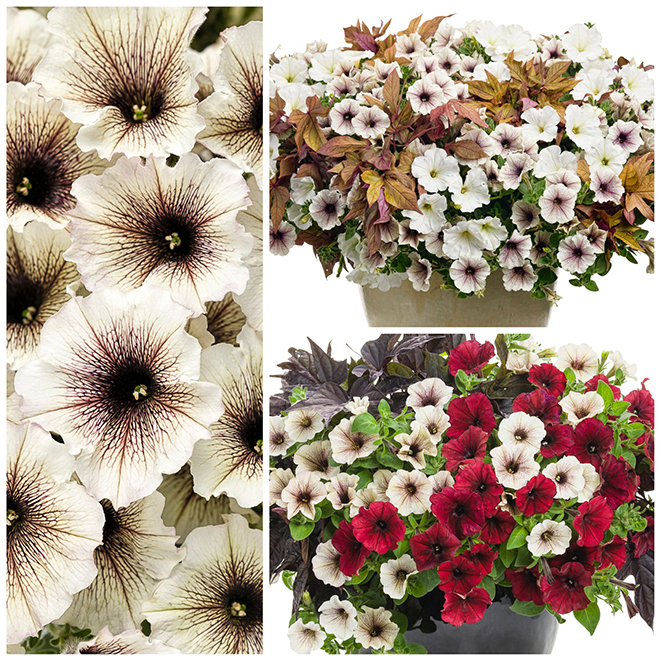 The bronze foliage of Illusion® Garnet Lace sweet potato vine echoes the earthy tones of the bicolor’s throat while Supertunia® White petunias fill out the rest of the container with its pure-toned blooms. This combination has a more masculine feel than most of the other combinations pictured above. Maybe it is just the right the combination to give your stud brother who just got his first place and needs something to spruce up that dingy balcony. In the bottom combination called Enchanted Garden, we’ve used the same bicolor flower to create a completely different look, this one more dramatic and perhaps more formal. Imagine this combination used at a wedding where the bride is dressed in ivory and her maids in scarlet. Stunning! Here, we’ve used the deep purple foliage of Sweet Caroline Raven sweet potato vine to echo the dark throat of Supertunia® Latte and the romantic red Supertunia® Black Cherry for a pop of contrast and passion. If you’re not a fan of red, deep magenta or burnt orange could work equally well here. When you’re shopping for flowers for your containers this year, start with bicolor blooms. Choose the ones you can’t live without first and then use the color echoing tool you’ve learned here to find other flowers or foliage plants to create the perfect pairing. Your containers will look like they were designed by a pro because they were—you! Want to see more bicolors? 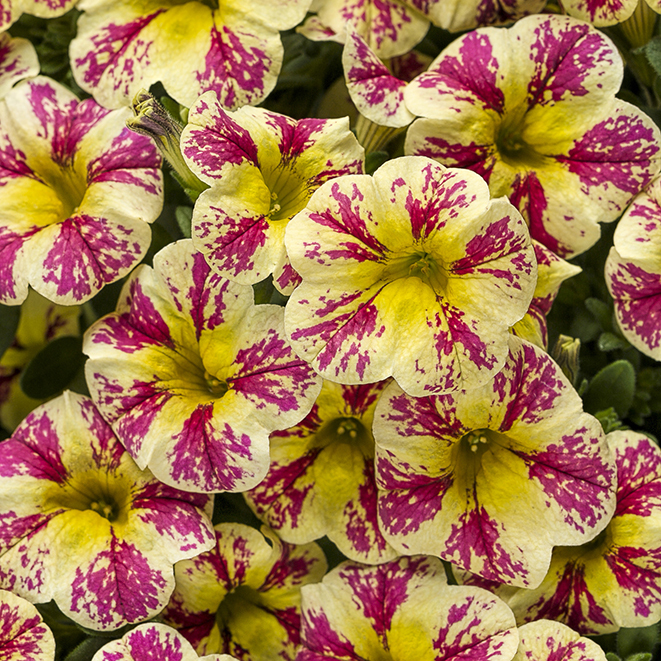 Read about new bicolor flowers from Proven Winners here. Patent Info: Luscious® Berry Blend™ Lantana camara USPPAF CanPBRAF. Supertunia® Vista Fuchsia Petunia USPPAF CanPBRAF. Supertunia® Pretty Much Picasso® Petunia USPP21649 CanPBR4078. Sweet Caroline Sweetheart Lime Ipomoea USPPAF CanPBRAF. Superbells® Blackberry Punch Calibrachoa USPP22964 CanPBR4382. Snow Princess® Lobularia USPP21594 CanPBR4189. Superbells® Holy Moly!™ Calibrachoa USPPAF CanPBRAF. Supertunia® Limoncello Petunia USPP23282. Sweet Caroline Raven Ipomoea batatas USPPAF CanPBR4539. Supertunia® Black Cherry Petunia USPPAF CanPBRAF USUtility7642436B2. Superbells® Cherry Star™ Calibrachoa USPP23232 CanPBR4594. Supertunia® Latte Petunia USPPAF CanPBRAF. Illusion® Garnet Lace Ipomoea batatas USPPAF CanPBR4537. Supertunia® White Petunia USPP25485 CanPBR4778.